It all starts in eastern Uganda, where the coffee is grown and picked on the slopes of Mt. Elgon by the Peace Kawomera Co-operative. Coexist Coffee is SHG (Strictly High Grown, sometimes called Strictly Hard Bean), which means it’s grown at least 4,500 feet above sea level. Beans grown at high altitudes mature more slowly and tend to be denser, larger, and have better flavor. The consistency and taste attributed to SHG beans makes them more desirable and thus usually more expensive than beans grown at lower altitudes. After it is picked, the coffee is graded and processed. 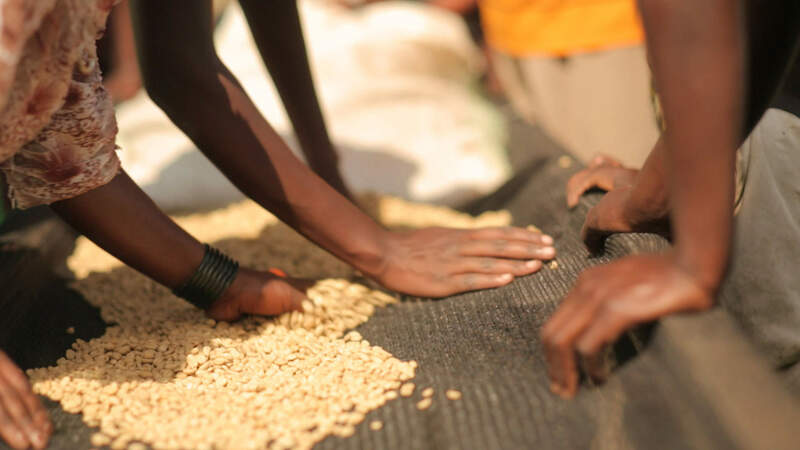 Peace Kawomera uses the dry processing method (sun-drying the beans) and hulls and mills the coffee beans by hand. The coffee is then cleaned and sorted manually, commonly called European Preparation (EP). This means workers sort out defective coffee beans, note the color, and do the final cleaning by hand. Only the best coffees are prepared this way. The coffee leaves Mbale by truck and heads east to Mombasa, Kenya, which is the biggest port in East Africa. Royal Coffee New York, our importer, receives and inspects the coffee in Mombasa before loading it into a container. A full 20-foot container holds 300 bags of green coffee. Each bag is 60 kg (132.28 lbs. ), so a full container is 18,000 kg (39,683 lbs.) of green coffee. That’s a lot of coffee, but keep in mind that you lose some weight in shipment from the green beans drying out (about 0.02%) and then again during the roasting process (about 20%). The container is put on a ship headed to New Jersey, and will end up with about 39,676 lbs. of useable green coffee, which becomes about 31,740 lbs. of roasted coffee. Once it arrives in the U.S. and clears customs, Royal Coffee delivers it to Continental Terminals. Continental stores our green coffee until we need it roasted, at which point they ship individual batches to our roasters who then mail it directly to you or one of our retail locations. Overall, your coffee travels over 8,100 miles as the crow flies before hitting store shelves or arriving at your doorstep. As always, you can purchase your coffee in our store or at one of our retail locations.